A French energy giant is the front runner to take on tens of millions of pounds of Northern Ireland Housing Executive contracts following the collapse of Carillion, the Belfast Telegraph can reveal. Last year, the Belfast Telegraph revealed that EY was trying to sell off all of the firm's business on the island of Ireland, weeks before it went into liquidation. And last week the business was placed on the market once again by PwC. Carillion employs approximately 500 staff here, with around 230 working for the NIHE. Across the UK, around 20,000 employees still face an uncertain future. Asked about the frontrunner bidding for the Carillion contracts, a spokesman for the NIHE said: "We continue to work with PwC regarding the Carillion contracts. "We are not in a position to make any further comment at this stage." Engie was contacted for comment but did not respond. The French utility company, which also works in maintenance, entered the domestic energy market in Great Britain last year. Yesterday, a further 452 UK jobs were lost as a result of the collapse of Carillion. The Official Receiver said the jobs cover a variety of roles connected with private and public contracts across the UK, as well as back office functions. The job losses are on top of the 377 that were announced on Friday. It’s thought that these posts relate to contracts elsewhere in the UK. A further 100 jobs linked to public sector contracts have been safeguarded, said a statement, adding: “We appreciate this will be a difficult time for those who have lost their jobs. “... people who have been made redundant will also be entitled to make a claim for statutory redundancy payments. But there are concerns over the future of the Northern Ireland workforce, amid calls for the NIHE to employ the workers directly. Following the liquidation of Carillion’s Northern Ireland business last month, TUPE regulations no longer apply, meaning staff would not have to be transferred to a new firm if it takes over the Carillion contracts. Speaking this week, Shadow Business Secretary Rebecca Long-Bailey said: “The Government has let down workers and businesses impacted by Carillion’s collapse. “Eight hundred workers have lost their jobs, more are left not knowing what the future holds for them and Carillion’s shoddy treatment of businesses in its supply chain threatens even more jobs. “The Tories have failed to protect the pay, conditions or pensions of workers on Carillion contracts. 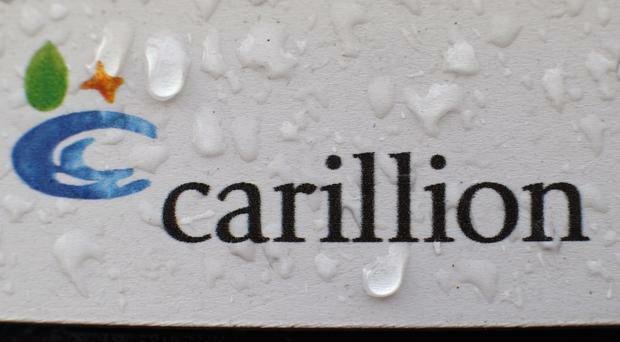 Carillion’s liquidation left in its wake a £900m debt pile, a £590m pension deficit reported by the firm, and hundreds of millions of pounds in unfinished public contracts. And the accountancy watchdog is to open an investigation into accountancy firm KPMG over its audits of Carillion. The Commons Work and Pensions Committee criticised the collapsed outsourcing company after publishing a letter from Robin Ellison, chairman of trustees of Carillion’s pension scheme, which gives an account of the firm’s pension scheme. The listed firm was granted a temporary lifeline in Northern Ireland last month, as it’s understood it was given a line of credit to continue some of its key operations here.